The opposition UPND is stunned by what it has termed as the numerous lies from President Edgar Lungu that Zambia is food secure. UPND Chairman for Agriculture, Livestock and Food Security Levy Ngoma said following the lifting of the ban on the export of maize by Government recently, it is common knowledge that most people will resort to export their maize because it fetches for more on the international market. 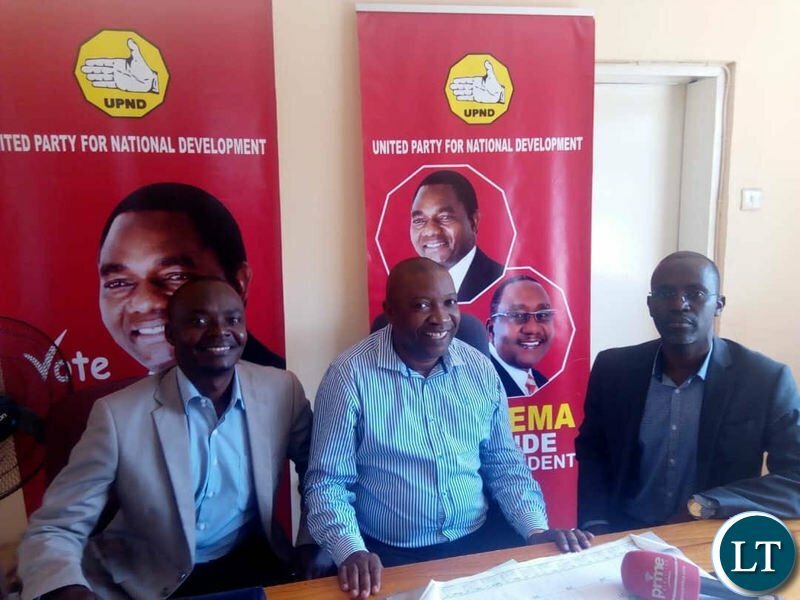 Mr. Ngoma said UPND is not surprised that such sentiments are coming from someone who has a record of lying in order to appease the hunger-stricken citizens and to win their sympathy so that he benefits politically. He has challenged President Lungu to avail the UPND as well as the Zambian people with the criterion and data gathering methodology that he used to arrive at such conclusions. Mr. Ngoma said had President Lungu been to all the four quarters of the country to understand the agricultural phenomena in the country. He said the UPND is however not surprised that someone who doesn’t mind whether farmers receive their farming inputs on time or do not receive anything at all, would care much if their maize yields are good enough to sustain their livelihood. Mr. Ngoma said it is unfortunate that President Lungu wants to create an impression that Zambia has a sustainable mechanism of feeding its people when majority Zambians go without three square meals, which, your guess is as good as ours: nshima. He said it is frightening that the Head of State thinks that Zambia has a lot of food without taking into consideration a few factors such as the maize stocks at time of issuing the false statement; the monthly consumption by the people in the country and what are the expected harvests in the wake of a drought. Mr. Ngoma said UPND further finds it hard to believe that President Lungu is telling Zambians that the country is food secure when the people of Pemba are feeding on wild fruits such as Masuku, Kawawasha, Vibuyu and Black Jack for survival. He said the UPND is also surprised at Government’s plan to send relief food to the Malawi, Zimbabwe and Mozambique that has been ravaged by cyclone Idai while most Zambians are grappling with survival, with the closest example being Siavonga District where, according to area DC, Lovemore Kanyama that the people of the District needed more than 800 metric tonnes of maize in relief food. I am a bit jittery by the claim from Government that their is food security in the land in the light of an open window to sell maize meal and against a backdrop of a menacing partial draught. I think the deads have a point. We need to trade carefully. Food relief to draught stricken areas is not always sustainable seeing that vast areas of land hasn’t had a wet kiss with the heavenly falls. I caution trade carefully for a hungry man is an angry man. We don’t want to witness skyrocketing corn meal prices. For Citizens’ sakes proactively review LPM/Mundiya Sikatana’s successes in the Winter Maize Project. The produce of the project is what you should be selling. The market is ready so prodently diversity your economy. Do both soccer teams have enough food this weekend? I mean Under 23 and Senior team? Usual they don’t. Ba Ngoma, ECL does not need to go round to gather information. That is the work of Min of Agric and CSO. They have done crop harvest surveys and they indicate there will be surplus maize. Why display your ignorance? He is right. There is drought in southern, western and central. You can see that when hh is right we support. But we our friends anything from lungu is wrong and they think we are all pf tribal cadres. You should as well not take prayer for a joke. When you are called to pray for rains dont politicize it just go and join others. You UPND guys are always a joke…..now you are crying hunger coz it has not rained. Who has the true information about maize stocks in the country between govt and the opposition and who is manufacturing a lie? Government of course but they should not be complacent about what they feel they have. Any supply chain mechanism requires that there is a steady production for an entity to engage in business. Selling maize stocks on a limited or stable inventory is a shocker. Maybe we could be food secure if we don’t engage is selling. Careful with Zambians when they go hungry. Do we have a mole misleading in Government? This defiles logic. UPND should not just speculate. They should provide data as the basis of their arguments. Government has data about what is FRA storage. UPND where is your source of data. Gov’t has lifted the ban on mille meal not maize. Southern and western provinces are not the whole Zambia. The drought has just hit Bantustan opposition region and parts of eastern province. Why worry? @ Munene you should worry because its the hard working and productive regions that have a crippling drought. What do my mbuyas in the north know about farming? I’m progovernment, but I would prefer those for statistics to assure us with confidence that we are ok food wise. Price is not a problem but when one province suffers food deficiency regardless of their political beliefs, the provinces that are blessed with food must cover the unfortunate province. Its very true that there is no food security in the country. Food security to speak of can only be achieved if and when the cost of food becomes affordable for all Zambian citizens so that they all know where the next meal is coming from. Having foodstuffs in supermarkets and marketplaces for sale at unaffordable prices is not food security. That food belongs to the owners of the supermarkets and the vendors at the market. We can only have food security when we all can afford three square meals a day… Therefore to the gentleman from upnd, I do hope your party has a strategy to reduce the cost of living and create jobs so that all citizens can put three square meals on his dining table. Even when the deads were in a 100% purity, Zambia can afford complete 3 meals for EVERYONE. My friend even when mealie meal used to cost K3 per 25kg bag not all families had 3 meals per day. I remember when relatives from Chiwempala used to send their to come and collect the stuff from our home. There will never be a heaven like life. Even if the Upnd formed government, you shall still have less fortunate citizens. Do you know that in spite of wars the Congolese are somewhat better off than us? Reason is that they are very resourceful. Very rare you will hear them saying GOVERNMENT THIS GOVERNMENT THAT. UPND and the leadership should put the facts right, government has not lifted the ban on mealie meal, and maize. Two days ago I visited the boarder towns Kasumbalesa/ Chililabombwe, Sakanya/ Ndola, Mwinilunga/ Kolwezi, Mwense/ Kasenga all boarders have ZNS and Zambia Police controlling smuggling. They allow only 1 bag per person per day, Levy Ngoma please learn to put facts right before the Nation. Do you understand how syndicate operates. 6.1 That’s what people fail to see. While it could be true, these guys are just shooting in the dark without any idea what’s out there. They have just jumped on the bandwagon without research. That’s why when asked how they will create employment, they won’t tell you. It would help if they were able to give us a breakdown of quantities depot by depot. Doesn’t the Government buy enough maize stocks every year through FRA to make the nation food secure? Don’t we have enough maize stocks with FRA right now? Under5 always want to alarm the nation, what is wrong with this de.monic party!